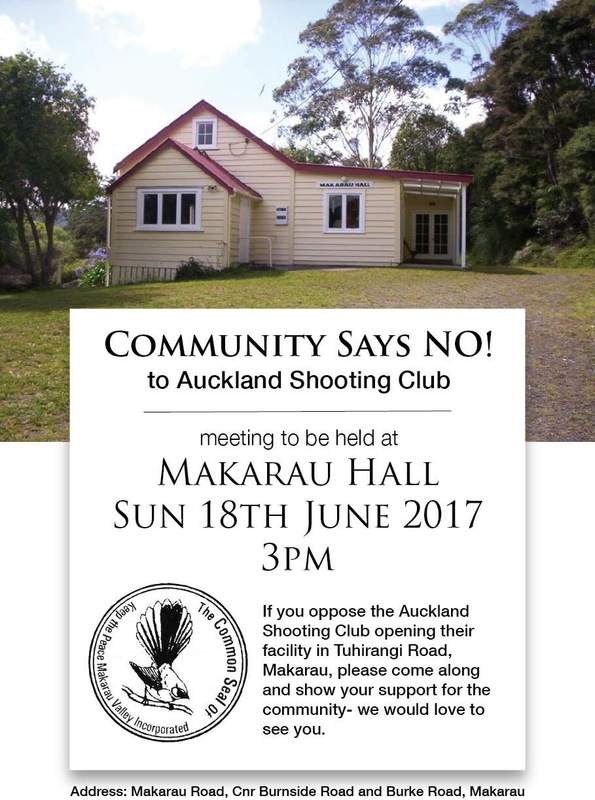 Recent community meeting @ Makarau Hall, opposing new Shooting Club on Tuhirangi Rd. Simon Wilson, a journalist from The Spinoff attended the community meeting held in Makarau Hall this last Sunday and has provided this well balanced and informative write-up on the meeting. There is a growing amount of local concern in the shooting club as it nears their opening date of the 1st July. The newly formed club is situated at the top of Tuhirangi Road, which is just under 600m from the closest section of Martin Access Rd and also in close proximity to properties on Makarau Road too. – It is obviously closest to neighbouring properties on Tuhirangi Road. A local group “Keep the Peace in Makarau Valley Inc” has been established to coordinate a community effort in opposition to the development and operation of the club and have been fighting the issuance of a ‘Certificate of Compliance’ which was granted by the Auckland Regional Council last year. shootingclubaction@gmail.com – this is their email address if you would like to request further information from them. The club has publicly stated; they aim to build a significant development with over 30+ ranges; including a 300m high powered rifle range, two other rifle ranges, and shotgun shooting facilities, operating 7 days a week, they currently intend to open to their members on the 1st July, with a formal opening, featuring MP, Paula Bennett on the 7th July. We’re holding a community meeting at the Makarau Hall this Sunday at 3pm. Please inform your friends and neighbours and spread the word. We’ll update on what has been achieved so far, why it matters, and what you can do. It will also be a chance for people new to the issue from the community to get involved. We plan to speak for half and hour and then answer some questions, and offer some tea and biscuits. It may take an hour all up. Please do invite as many people as you can and do your bit to Keep the Peace in this beautiful valley. Update on shooting range developments and further information. The proposed site for the Auckland Shooting Club’s new shooting range on Tuhirangi Road has generated a good amount of local interest. Which has included a number of local residents contacting the council for more information and a better understanding of the process which has been followed. I will try my best to accurately represent this below (if you know of any corrections please let me know and I will subsequently amend the posted web based version of this with any corrections – thank you). The owners / developers of the property apparently bought the land in July this year and conducted planning exercises which included having assessments and reports written up by various domain experts, including acoustic engineers and development planners. A submission was made to the council which expressed a fairly limited and modestly sized operation, they requested a CoC (Certificate of Compliance). Given the nature of the operations expressed within this application, and the modest scale expressed, both in terms of size of development and also the noise thresholds, and types of firearms to be used at the range; the council assessed the proposed operation against the district plan and current and future zoning. Given the assertions made in the reports, and the council’s own cross-checking, they deemed that if operations were limited to that expressed in the application that Resource Consent was not required as the expressed, intended operation fell within limits already permitted for the area. As such, the council did not need to, nor could they, require resource consent. And so there has been no public consultation required or possible by the council with the local community. The council issued the CoC, in compliance with their established operational procedures. In general terms, the council have advised us that the CoC covers operations as laid out within the CoC and the associated report; it does not provide assurance to the owners that operations outside of that scope would be permissible under the regional plan etc; that is not to say that anything outside of that scope would be automatically prohibited, or would be constrained by default. It is possible that the owners may extend their operations in a non-permitted manner, but if they did, then it would take some form of action, a complaint and an upheld investigation to then force the owners to require resource consent. The council are not forced to observe or manage operations in any way; whether operations fall within or outside the CoC, is a question which will become very hard to answer without access to the property / facilities once they become active. It should also be noted that the owners / club are accountable for their operation but that this is a self-monitoring activity. There will be no policing or compliance checking conducted by any external party, this is not a requirement of the CoC, the council are not obligated to perform this for you. From here on, their continued operation will be subject only to ‘exception reporting to the council’, whereby someone would have to raise a concern (with evidence) to back them up in order for any type of council action to be taken. It it not specifically enough, to say that they have exceeded the CoC, even in terms of hours of operation; they need to have exceeded what is generally-permitted-activity in order for resource consent to be required. A CoC is not strictly required to operate, what it does is it provides a clear and well laid out set of standing authority for that described activity to take place; it is (only) in the favour of the land-owners. You should not view the CoC as a limiting document, it is an empowering document for the land-owners. As and when the operation may exceed what is generally-permissible without a resource consent; in order for any one of us to know exactly when this has happened, we would need to be an arm-chair expert in local zoning regulations and actively monitoring their operations. – The likelihood of any one of us getting this right, and achieving anything actionable is slim. It would likely take the same degree of expertise as held by the consulting group who crafted the CoC application, to know when, exactly, the general zoning permissible activities had been exceeded. While this has the potential to turn some of you into warrior-crusaders against their cause, for you to actively achieve anything tangible would take an enormous commitment from you; it would’ve had to have ruined your lives by that point. Auckland Council issued a certificate of compliance to the Auckland Shooting Club, which simply confirms that the operation of the club, as detailed in their application, is able to comply with the requirements of the Auckland Council District Plan – Operative Rodney Section 2011, and the Proposed Auckland Unitary Plan (at the time of the application). A certificate of compliance confirms an activity can be undertaken lawfully at a particular location without the need for a resource consent, and the council has no ability under the Resource Management Act to notify such applications. The council will not step in, they cannot step in, unless a well founded, and legitimate complaint is laid (which needs to be based on a violation of some by-law or regulation). They are duty bound by their processes to respect the club’s desire to operate, and if they do operate within the bounds of permitted activities under the zoning regulations (not specifically within the limits of the CoC), then they cannot get involved. – And this is fair enough. I’d like to reflect on the type of people who get involved in establishing sporting clubs; they are well meaning, enthusiastic people, they are looking out for the interests of a collective group, their efforts are for more than just themselves. – They are often very focussed and passionate about their interests. A reflection on firearm owners / license holders: They are of good standing, they are almost always reputable people. On pistol shooters: these are some of the more elite users of firearms; it takes a further, specialist application to the police to be licensed to hold a pistol category license. A reflection on the council’s attitude to the range; they are impassionate about this; they have viewed this by the book and have made their decision / determination based on their current operational procedures. They have operated appropriately in terms of their impartiality and they’ve conducted themselves in the only way in which they can. A reflection on how this will be seen / treated by the police: organised and well run shooting environments are encouraged, the police play a key part in permitting and enforcing responsible firearms usage in NZ; they administer the licensing system. On the whole they can be expected to come out in support of this range and the activities conducted at it. The police actively use a number of these types of ranges throughout the country for their own training. A reflection on the current CoC; The units of sound measurement in the CoC are a concern to me: dBA (Leq) is an averaged noise level over a period of time, not a peak noise reading. It is beneficial for the applicant to use this means to express sound exposure for short bursts of noise, as the level is expressed as an average; it does not appropriately describe the peak noise level which is experienced. To say that the expected noise levels are “45 or 50 dBA“, would be wrong; this is what some of the comparisons have been likened to; ‘noise levels of rain on a roof’. As an averaged level this may be true, but in terms of noise exposure (max) this is a misleading representation. See http://www.noisenet.org/Noise_Terms_Leq.htm for a brief explanation of these units. The district plan allows for this in its current state: http://www.aucklandcity.govt.nz/council/documents/districtplanrodney/rodney-district-plan-chapter16-2011.pdf – The acoustic report provided to support the application was in line with these averaged measurements and aligned to the district plan’s limits. It is the district plan itself which has directed this style of measurement to be used within the application. The district plan was written with ‘general / continuous noise’ in mind, of the type which you would generally be expected to be exposed to, within a rural area: farming machinery, milking plants etc; it does not cater specifically for exposure to short, sharp cracks of gunfire. The plan itself aims to meet a general purpose, it is that general purpose which is perhaps being exploited currently by the CoC application and the misleading comparisons with ‘rain on a roof’ statements being made by various people – which are plain wrong. http://www.aucklandcity.govt.nz/council/documents/districtplanrodney/rodney-district-plan-chapter16-2011.pdf – See Pg 12: Table 16.9.2.1.2(i): Noise Received in Rural Zones (Leq) – it will become clear why the 6pm upper limit was applied, that because the units of measurement change from dBA(Leq) to dBA(max) at 6pm, and although the level is higher (75dBA[max]), I suspect that the (max) method of measurement is what will have forced the applicant not to have sought any permission to operate beyond 6pm. You can draw your own conclusions then as to what type of (max) level may be emanating from the range during daytime hours…? 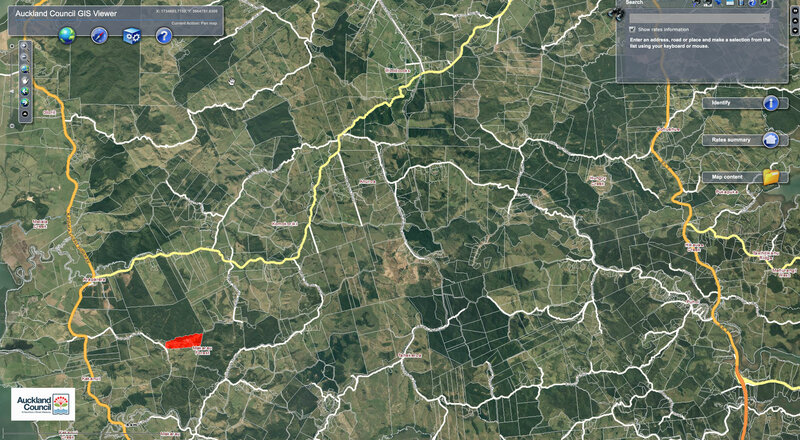 Noise has been identified in Chapter 7 – Rural, as having an adverse effect on the amenity values of rural areas. The protection afforded dwellings in the rural area needs to reflect that rural areas are essentially production areas, where significant noise generating activities can be expected to occur. The control level should therefore not be unreasonably stringent, and should recognise the time of day when rural activities take place; that is, they start earlier and finish later than in urban environments. The notional boundary approach is used to protect the dwelling without giving the same degree of protection to land closer to the noise source. Reflection on the above: when the council are describing rural activities, they are describing the largely Rural Production type of activity, this does not appear to me to be crafted for recreationally orientated (or firearms) noise, they state that rural activities specifically start earlier and end later. – This is bordering on a misapplication of those rural limits, it is making use of a loop-hole in my view. The Unitary plan is being constructed to replace the current Regional Plan, and the feedback period is now closed. I would have liked to have seen an over-riding noise limit placed throughout the day, with a dBA(max) limit being applied throughout the daytime hours too. In that way, this type of activity could still be permitted as it is measured at the notional boundary. All this would mean is that they would need to surround themselves with a truely-large-enough, privately owned buffer zone to ensure that their ‘cracks’ could not exceed (max) stated limits for neighbours. I do not believe that the Leq method of measurement was deliberately introduced to permit repetitive, sharp cracks of shooting noise over boundaries from 6am to 6pm during weekdays and during weekends. Approaching council about this particular point is unlikely to create any shift, but it may be reasonable to write to them expressing concern that the dBA(Leq) method is applied to all types of noise universally, including those which have a sharp, loud peak. It does not provide for any specific protection or noise control as it ought to be applied to gunfire to prevent nuisance for neighbours. – This may be a reasonable question to ask the council? Before you do any shooting, whether with a firearm or airgun, you need to know when and where it can be safely and lawfully used. You should take steps to ensure that your shooting does not endanger property or frighten, annoy or put neighbours at risk. Telling your neighbours about what you are doing is always a good first step. Section 48: amended, on 1 July 2013, by section 413 of the Criminal Procedure Act 2011 (2011 No 81). This is part of criminal law, it is no longer a civil offence; this is not something which a council CoC can guard anyone from. However, for this to be enforceable, you require the interest and cooperation of the police. – Which, you would get (initially) as it is a potential firearms offence, however you may not get their support on an ongoing basis for nuisance complaints. All of this is provided just for your information; there are plenty of reasons why the owners and users of a facility like this are expected and required to be reasonable. It is in their best interests not to fall out with the local community, but to work with them. Many gun clubs around the country have suffered restrictions, loss of members and faced potential closure through persistent noise complaints. Take a look at these two linked articles on stuff to see how hard things can become for gun clubs when they fall out with their neighbours: http://www.stuff.co.nz/auckland/local-news/nor-west-news/83478097/Waitemata-clay-shooters-under-the-gun and http://www.stuff.co.nz/auckland/local-news/papakura-courier/7568626/Bullseye-Gun-club-wins-long-battle-with-neighbour – (I would hardly call that last one a ‘win’ given the battle and loss of membership experienced). Reflection on the comments provided on the Grapevine’s Facebook presence: On the whole the discussion on the Facebook comments section was courteous and allowed for a degree of natural exploration of the potential issues. Discussion for the initial part was civilised and helpful for a community group trying to grapple with what was seen as a concerning issue. This was ‘shocking and concerning news’ for most locals, and the discussion was kept to practical and useful comments while people sought more information and expressed their initial views and concern. We also had comments from supporters of the Club too; and they were welcome to post and share their views too; the presence is a public one and we do not discriminate or require membership in order for people to comment. I do not want to moderate content in the group, I simply don’t have the time; I would make it a closed FB group before I start to actively moderate. Then, as Facebook always does, it degenerated somewhat. Some people started to personalise their comments, calling others ignorant… Unfortunately they got a reaction and things went downhill a little from there. It became a disappointing, non-constructive slagging match. Disappointing, as we ought to have tried to work the two sides together with useful and informative discussion. Given the owner’s investment to-date, while you may not like the idea that a large scale shooting range may be opening across your boundary fence within the near future, it is a reality that they can operate under the current district plan. – I would suggest that we seek to engage positively with the owners to proactively discuss their intentions and to see if your concerns can be managed proactively. I suggest that you do not engage on Facebook in any type of discussion which may end up degenerating into non-productive exchanges, if you do then don’t be surprised if you get blocked from our page; regardless of your point of view.. The CoC is just a document, it does not truly determine how they will operate, it also doesn’t strictly constrain them either. Only reasonablness on both parts will help to make this something which is both tolerable (for you, all) and also usable (for them). I understand that my view is a moderate one, and is not as extreme as some of our local neighbours who live on the boundary of this proposed facility; I would encourage all of those who have a view on this to nominate a coordinator (not me), and seek an initial (private) meeting with the owners… We might start by asking them what their measured dBA(max) levels were during their acoustic testing, then re-framing a more reasonable discussion – without any comparison to ‘rain on a roof’, or average noise levels. Chris – Ahuroa Grapevine Administrator.